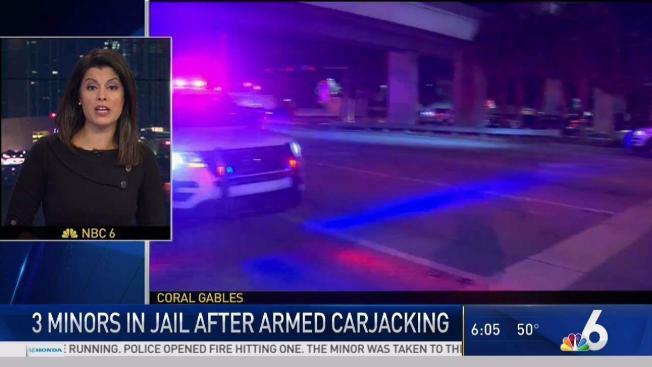 Three juveniles were arrested after an armed robbery and carjacking in Coral Gables Monday night, police said. Coral Gables Police said the robbery happened at the parking garage at 1518 San Ignacio Avenue around 7:40 p.m.
A couple had parked their car and were walking from the vehicle when the three suspects ran over to them and one of them pointed a handgun at them and demanded the car keys and a cell phone, police said. The suspects took the items and fled in the stolen grey Toyota Corolla. Police put out an alert for the car and a description of the suspects and two officers spotted the car about 20 minutes later in a parking lot underneath the Metrorail at Alhambra Circle and Ponce De Leon Boulevard, officials said. The three suspects were taken into custody, and a handgun and the victim's cellphone were recovered, officials said. The suspects are facing charges of armed robbery and grand theft of an automobile.